I am proud to offer a variety of Reiki classes and sessions. I have been studying and practicing Reiki since 2013. 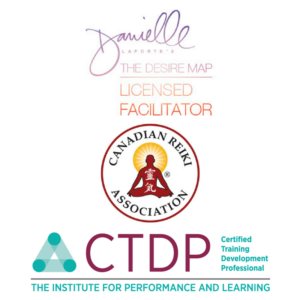 In 2015 I received my Reiki Master/Teacher certificate, and in 2017 I received became a Registered Reiki Teacher with the Canadian Reiki Association. I have experience sharing Reiki for both hands-on and distance healing sessions, as well as teaching Reiki. Also I use Reiki as a relaxation and self-awareness technique during my one-on-one coaching sessions and Desire Map workshops. Not sure what Reiki is exactly? Check out my blog post: What is Reiki? How does it work? And what does it do? (here). I teach traditional Japanese Reiki (Usui Shiki Ryoho). My lineage is through Sensei Takata; I am 8th in line to Sensei Usui. So in my classes, I teach all five elements of Reiki and believe that the combination of these elements is the key to a powerful Reiki practice. 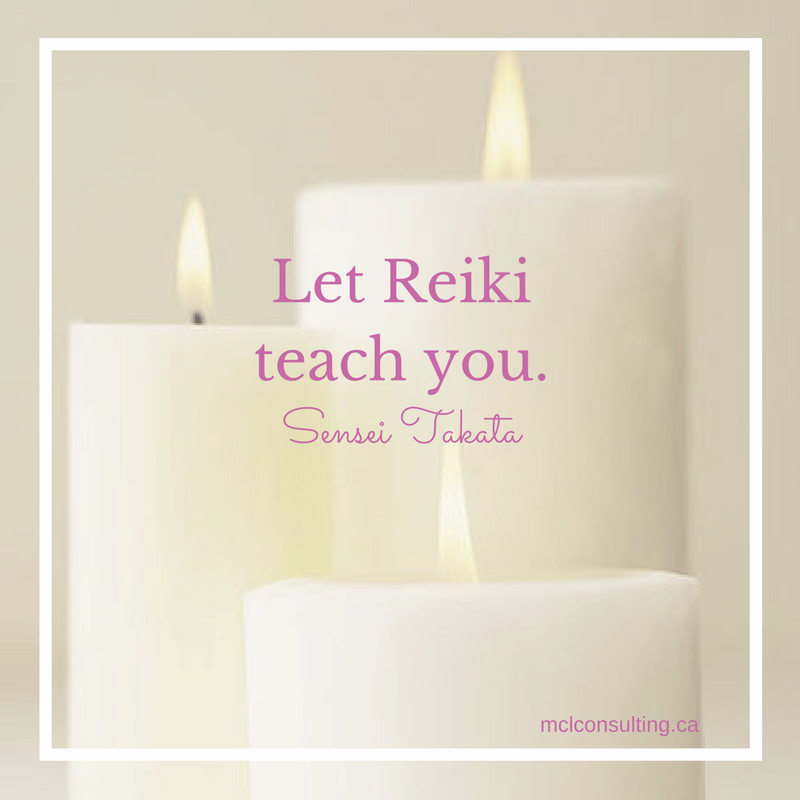 Traditional Usui Reiki is taught in three levels. Some Masters/Teachers divide the final level into two classes so they can provide more instructional for those intending to teach Reiki as well as provide treatments. I believe that students need to time to practice Reiki and time to experience Reiki. So my classes are small and only taught in person. I believe that integrating Reiki into our daily lives makes the biggest difference to our overall wellbeing. So my classes include access to a private Facebook Group for support. I believe that learning never ends. So my classes include access to a password protected area of my website for extra instruction. Lastly, I believe that preparing for a Reiki class creates a smoother post-attunement period. So I offer a series of mini-lessons on meditation and journaling to students who pay their deposit at least 6 weeks prior to class. I am currently teaching Reiki level 1 and Reiki level 2. I plan on teaching Reiki level 3 in the future, but these courses take a considerable amount of time to prepare for as well as create. I estimate that I will be teaching Reiki level 3 in 2018/2019. I can say with total conviction that I am called to teach all levels of Reiki. I believe not everyone is meant to complete all levels of Reiki. You can be practice Reiki masterfully at any level. But I do believe they do need to be taken in order and with the same Teacher/Master. And I believe there needs to be at least 30 days between each level, preferably several months. Note: All of my Reiki classes exceed the Canadian Reiki Association requirements. This is an introduction to Usui Reiki. You learn about how Reiki works as well as how to channel it and share it. At the end of this level, you will be able to channel Reiki for yourself, loved ones, and even your pets. This level of Reiki focuses on channeling Reiki for you; for your own healing and development. The Reiki journey always begins with you. I encourage level 1 students to share Reiki with friends and family, as well as donate their time and Reiki skills (i.e., hospitals, oncology departments, cancer treatment centers, women’s shelters, etc.). Interested? You can find more information about my available classes and register here. This is the level that deepens your Reiki skills and knowledge so that you are comfortable channeling Reiki for clients. This is the level that prepares you to be a Reiki practitioner. I believe that credible Reiki practitioners have at least completed this level. You will learn about the chakras and meridians, as well as expand your understanding and experiences with Reiki to include time so that you know how to channel Reiki across time and place. At the end of this level, you will be able to complete a distant Reiki session, as well as use a pendulum to help guide your sessions. At this time, I am only available for distance Reiki healing sessions. I’m sorry, I am not currently accepting any new Reiki clients for in-person healing sessions. You can schedule a distance Reiki session by click the button below. Curious to hear what people are saying about my Reiki classes and sessions? Go here to read all about it.